It is Road Safety Week in the UK. A week where safety on the road is being publicised. A week where road users are being urged to look out for each other, especially those most vulnerable on the roads like school children, pedestrians and cyclists. A week where everyone on the road is being made aware of the lethal weapons that are hurtling about ready to maim and kill if they are not kept under proper control. No, I hadn’t heard of it either until I received an email asking me to promote it and raise funds to support it. I would have been happy to do something but the email arrived today, nearly halfway through the week. Surely it would have been better arriving a few weeks ago to give people a chance to get organised and to start getting the message out there before the week actually started. Never mind. I will do what I can because it is an important issue. For instance, just this morning I was overtaken by an articulated lorry whilst going downhill in a residential area at 25 mph. It squeezed between me and an oncoming car and then slammed its brakes on for the roundabout not far ahead. Anticipating the problem I was already on the brakes. Unfortunately his brakes were rather more effective than mine. Wet leaves all over the road didn’t help. Things went into slow motion as I watched the rear of the lorry getting closer and closer as I tried to control my skidding back wheel as it snaked from side to side. I was inches from impact when the lorry picked up a little speed as it started the turn. The gap grew to about a foot and then I was able to slither between the lorry and the railed kerb and take the first exit to escape. I don’t think the lorry driver had been reading much about looking out for other. Maybe if we can raise some funds there will be the resources to get the message out better next year. With such a short time scale the best fund raiser I can think of is a pledge by me to donate the profits from all the sales of my week this week to the cause. So if you have been thinking about buying now is the time to do it. Just visit http://www.landsend-to-johnogroats.co.uk/purchase-a-book for purchase options. As an alternative to following my new ‘Safer Way’ route from Land’s End to John O’Groats how about a completely car and lorry free route? If you invest in the new Schiller X1 ( $6,495, or about £4,000) you could make the entire ride traffic free: you can go by sea! 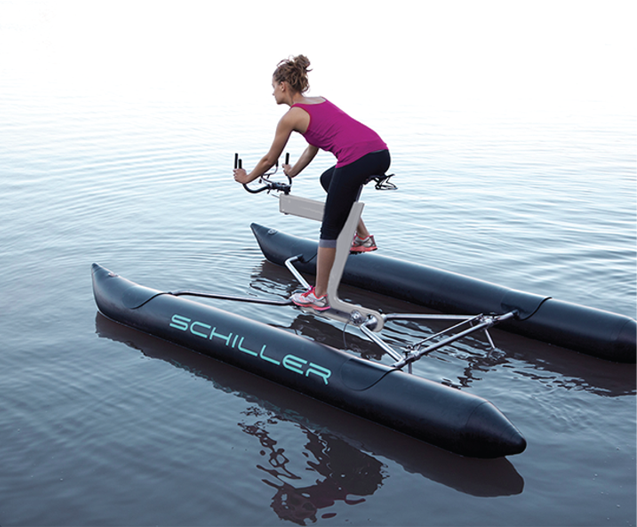 Pedal-powered watercraft are nothing new but with a cruising speed of about 9mph, this Schiller X1 is quite nippy. My average speed on a number of sections on my last two cycles across the country was only 10mph. The Schiller X1 uses twin oscillating propellors so there’s no need for a rudder, and has a Gates Carbon drive belt to avoid the obvious problems of running a chain in wet conditions. It can even go in reverse. Company founder Judah Schiller says the X1 can be assembled and dismantled in ten minutes and packs down small enough to fit in the boot of a car, though being he’s from Marin County, California, he may be thinking of the trunk of a Lincoln Continental and not the boot of a Smart car. Full details from Schiller Bikes.